This guide helps you to convert commercial DVDs to Galaxy S5 friendly MP4 format with multiple audio tracks, so that you can playback the movie on Galaxy S5 with different languages. As the next flagship smartphone, Samsung Galaxy S5 has attracted lots of attentions from fans all over the world. It claimed to be equipped with an astonishing Eye Scanner (IRIS scanning), a curved display similar to existing Galaxy Round, which one of Apple iPhone or other smartphone does not have. There have been so many rumors about this new smartphone, like will it equip a flexible round screen? Is it coming with a 64-bit processor? Will it be weather and dust-proof? Or about the super-sensitive new camera on board, etc. As I decided to preorder a Galaxy S5 long ago, I’ve also designed what I would do with it. It can’t be cooler to take this Galaxy out and enjoy DVD movies on the way to work, especially rainy days. Although Samsung has not revealed the specification of S5, we should think of that it won’t be designed with a port for DVD drive. Hence for people who also want to watch DVD movies on S5, we do have this problem: how to transfer my DVD collections to Galaxy S5 on PC or Mac? After spending several days trawling on the Internet, I found a free workflow with Handbrake –a software that rips DVD to various formats including the MP4 that Galaxy S-series accept. However, what I really want to keep is the audio tracks out of this movie. For some reason, I’d prefer to obtain both German and English of original movie so that I can switch the language when playback, which Handbrake doesn’t do. That’s the reason why I chose Pavtube ByteCopy as an alternative of Handbrake. Pavtube ByteCopy is a professional multi-track DVD ripping tool to roll off commercial disc protection and convert it to MP4 format that Galaxy S5 supports. It has a very easy-to-use interface and I don’t need to change any of the specs. How to rip DVD to multi-track MP4 for Samsung Galaxy S5? Click “Load files” to import DVD, DVD IFO/ISO or DVD folder. Choose subtitles, languages or forced subtitles in the main interface. Click “Format” drop-down list, choose “Multi-track Video -> Multi-track MP4(*.mp4)” for Galaxy S5. Click “Settings” to choose wanted audio tracks; leave the unwanted tracks unchecked and confirm the change. Now back to main interface, click “Convert” to start converting Blu-ray/DVD to MP4 for Galaxy S5. 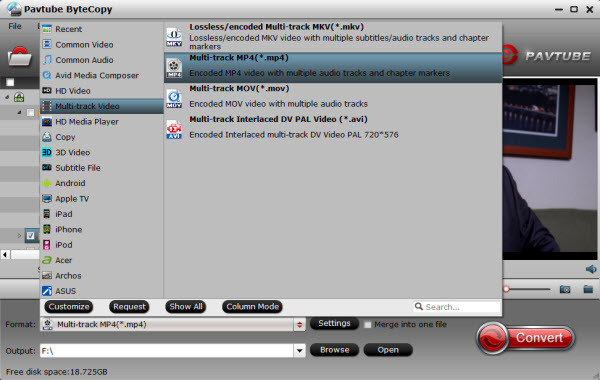 After the conversion, you can click “Open output folder” to quick locate the converted video.